Home > Vampire Fangs Dentist > Custom Made Vampire Fangs: Coming soon to a Dentist near You! Hey wanna-be vampires… what’s the one indispensable thing required for turning into a vampire? A respectable set of fangs, of course! Dentists all over the country can now give you permanent vampire teeth implants for a very reasonable sum of money. The best thing about these vampire veneers is that they won’t burden you in any way! These fangs are custom made for each mouth and therefore yours will fit perfectly. 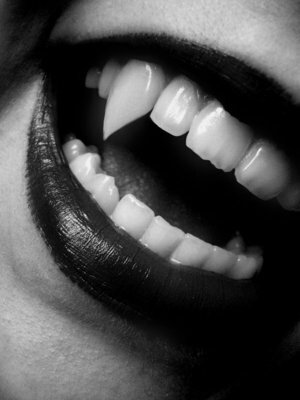 Dental veneer costs depend on the length of the vampire teeth you choose to get and of course, how many you want to get! These false vampire teeth will become a part of you so that you will be able to freely talk, eat and drink with them. And if you think you wouldn’t want fangs for the rest of your life then your dentist can have them removed after many months or years you ask them. New vampire teeth crowns are color matched to your other teeth so no one will ever be able to tell if they are real or artificial. You can treat them just like you should treat your real teeth; regular oral care will keep any problems away from your vampy fangs. You can even go ahead and consume all the tea, coffee, blood and even absinthe without the fear of staining your fangs. These cosmetic teeth will let you talk and even sing, so they are nothing like the weird plastic retractable ones that constantly threaten to fall off. Our dentist will make your vampire teeth crowns made of the same dental porcelain that is used to manufacture regular dental crowns. So you can forget about that weird plastic smell, bad tasting chemicals and harmful toxins in your vampire veneers.So what are you waiting for? Call us for an appointment and get feasting upon your nearest jugular today! This article was posted in Vampire Fangs Dentist and tagged cosmetic teeth, Dentist, dentists, veneer, Veneers. Bookmark the permalink. Follow comments with the RSS feed for this post. Trackbacks are closed, but you can Post a Comment. ← Bite Like You Mean It!